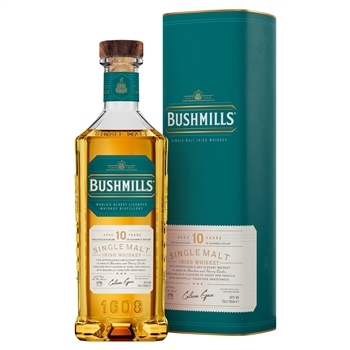 This exceptional 10-year-old malt whiskey has been distilled in the oldest licensed whiskey distillery in the world, having recieved its first grant to distil in 1608 Bushmills malt is a smooth, rich single malt with overtones of vanilla, honeyand sherry. The nose- for the first time in living memory there is real grape detectable on the nose; it appears to be of the crushed sultana school of fruitiness with a few minor honeyed notes also around. The taste- a fulsome delivery again with the grape at the vanguard; soft vanilla trundles along at Antrim speed; spices arrive with just a touch of cocoa for company. The Finish- soft with the work being done by the grape and toffee. The balance- this malt has now changed character enormously... and certainly not for the worse. Until recently it was traditionally a chalky effort, dry-ish with the accent on the barley and oak. Now the sherry is the major shareholder in terms of all round shape and depth. And very good sherry butts they are, too. A great leap forward: this is a lush and lovely whiskey.